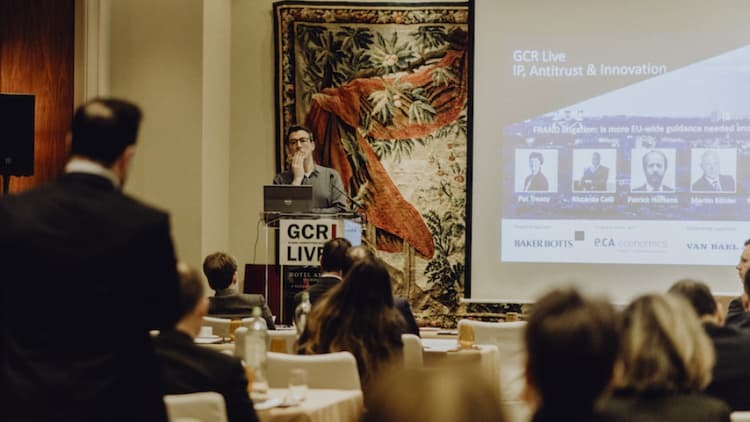 A transcript of the keynote given by Tommaso Valletti, chief competition economist at European Commission, at GCR Live IP & Antitrust in Brussels on 13 March. It’s a pleasure to be here to talk about innovation. Disclaimer: I’m speaking in a personal capacity, as I always do. I will start from perhaps at a slightly higher level to remind ourselves – this is not actually the topic of my introductory remarks – that there is a lively debate recently about concentration. There is some evidence, mostly coming from the US, [based on] the top four firms in different industries, that concentration is going up. The profit share of GDP -- there’s a macro indicator, so what is the percentage of GDP that goes to profits, which is an indication of rents -- is again going up massively in the past 20-30 years. These are macro indicators. But also micro: there is some work looking at margins at the plant level, for instance. You really look at the nitty gritty of the difference between prices and some measure of cost, and the economic margins are also on the rise. And there is an even wider debate that, again, starting from the ‘80s, something has changed and inequality -- imagine the work of Thomas Piketty -- is on the rise as well. So there are some trends. We don’t know the causes, but these have had an impact on some discussions we are having in our field. There are two types of reactions. Of course, there’s going to be also somebody in the middle. But there is a reaction from the conservative side and a reaction from the progressive side. On the conservative side the reaction is, forget about that, let’s try to deconstruct all those studies, the data are wrong, the antitrust markets are a joke because these are too aggregated, Piketty forgot this, he forgot that. Just dismissing as a lack of evidence and stopping there. Stopping there saying, we should continue doing what we’ve always been doing. Somebody associated for instance to this camp is Joshua Wright. The opposite camp that somebody calls the New Brandeis school, the New Brandeis school is saying: ‘this evidence, we all knew it, we don’t even need to engage with it because we had a feeling this was happening. We see what is just a confirmation of something we already knew; this is a failure of our antitrust enforcement.’ So they jump to the conclusion that there is a causation [from] the lack of antitrust enforcement. And they may have a point: in antitrust, for instance, the US is not very active. I’m going to argue that I find both camps extreme. You would expect that from somebody who is currently a technocrat; whatever is my soul, I cannot express it. I am in the middle and I see merit in people addressing these questions. I see merits also in trying to understand more, and we do some of this work at the Commission, trying to have the right definition or the proper antitrust market, to see whether this data hold true not just in aggregate but also in a better-defined market. But more fundamentally -- and this is a misunderstanding of the New Brandeis school -- I think it’s wrong to say that [under the consumer] welfare standard, we measure the only thing that we know how to measure, which is prices. From an economic point of view, when we assess welfare standard, the impact on consumers of course is due to the impact that some action or a merger has on prices. But also it has on quality, on the variety of the products, and on the innovation and on investment. We’re not re-defining a welfare standard; we are just trying to adopt the correct welfare standard, which is multi-dimensional. Yet, we still need to deal with outcomes, and outcomes can be related to innovation. What I’m going to say is driven by or at least participates in this larger debate of what is the objective of our intervention. I want to advocate for a welfare standard. We should be appropriately defined and correctly defined through the lenses of economics, for instance. Economics never said that we should only measure prices. Quality innovation is a very important part. Having said that, I will delve more into the details. Obviously I will spend more time on mergers because of our decision exactly a year ago on Dow/DuPont. This has created quite some stir. But I will say also something on state aid, which is probably a surprise, and antitrust. I thought of taking this opportunity also to debunk some myths which had been created. Part of our profession, some lawyers, also contributed to the creation of these myths, by selectively reading some lines of what we wrote. Sometimes better to have a more holistic view -- when you read the paper, read from the first page to the last, usually that’s useful. I wanted to still to give a message of caution about what we did and try to clarify at least what our approach is about. First of all, there is an innovation theory of harm and I want to focus your attention on what the two elements of an innovation theory of harm is. When two close and significant competitors, after a merger, may reduce the innovative efforts. They discover fewer products, or products arrive to the market less timely. A concern is that they may not compete to innovate, so there is less innovation. That’s clear. The other concern, which is perhaps less clear, is that the merger will reduce the intensity of competition for future products. Should they innovate, once they have an innovation, they will price those innovations in a way which is detrimental to consumers. These are the concerns of an innovation theory of harm. There are also benefits from a merger. Listen clearly: mergers can be beneficial to innovation, for instance when there are spillovers. Spillover means, in those industries, when I invest I obtain some benefits but I also give some spillover, some beneficial effect on my rivals, because, for instance, I cannot fully protect my innovation, [whether] my intellectual property or for whatever reason. Then obviously, there are these externalities: there is free riding; my rivals benefit from my innovation. In the absence of a merger, I don’t have a huge incentive to innovate because I benefit my rivals. If I merge, those externalities will be internalised. So presence of spillovers is a strong factor that leads to beneficial effects from the merger. If these two companies have a complementary assets also, a merger would be good. There are efficiencies to scale and other sort of efficiencies. The important thing in fact, and I will argue, that efficiencies which are really submitted in a context of innovation may be even more important than static efficiencies, precisely because they have an effect not just of good coordination of prices between complements, but because they may introduce new things into the market. Given this context -- and I’ve said mergers can be bad and I’ve told you why they can be bad, and mergers can be good -- I’ve just selected some myths that I’ve encountered in several places. One myth: ‘There are no limiting principles to the innovation theory of harm.’ If you understood what I said, I’ve already given you a few limiting principles, but I will be more specific. First of all, I’m going to state the obvious. A limiting principle is that innovation has to be an important factor of competition. We’re looking at industries where innovation can be important. What does it mean, ‘significant’? It means that if I innovate I divert significant demand away from my rivals. That’s what innovation is; that’s going to be the importance of cannabilisation in an innovation theory of harm. Conversely, if there is not such a thing, it means that new products will rarely arrive, and if new products rarely arrive, the static effects we typically look into are just fine. That’s a limiting principle. There must be overlaps between the merging parties. Overlaps in R&D, overlaps in capabilities. We can discuss about how to quantify the overlaps, but again overlaps means cannabilisation. In the absence of overlaps, the risk of cannabilisation is going to be low and therefore, our concerns are reduced. There must be only a few viable competitors in an industry, just a few, for two reasons. If you have lots of rivals, any attempt, for instance, to increase the price of future products will be defeated by those rivals. And also, if you innovate less, you leave a gap in innovation that will be filled by someone else. So the number of viable innovators is going to be key. There must be barriers to entry, which is related to the previous point. Here we have to understand that when we talk about innovation, almost by definition innovation is forward looking. Innovation has a long cycle. We may have a discussion about ‘how long is a long cycle’, but it is true that we have to look a few years into the future, and sometimes even many years. In Dow/DuPont we looked 10 years into the future. It will depend on industries. These are some limiting principles which are quite important. Sometimes I’ve read people quoting the Commission, and the Chief Economist team in particular, saying that ‘every merger is bad for innovation’. I hope I’ve just told you that’s not true; this is not to be found anywhere. Actually you can find, as a typical academic paper -- you write a model, sometimes economists do, some of us still like to do that. And then you have assumptions. Assumption one, two, three, four, five, and then you conclude under these assumptions, a merger is bad for innovation. It doesn’t mean that every merger is subject to those assumptions. For instance, the absence of spillovers, the absence of efficiencies, the absence of complementarities, blah, blah, blah, then a merger can be bad for innovation. Anyway, we never said that and I’ve just given you, for the sake of understanding each other, a set of limiting principles. It is important also that we want to look at the effect of a merger on innovation, which has to be significant of course. It’s not just a theoretical possibility. Another myth, which is coming in different formats: ‘It’s impossible to predict the future.’ I think this is to be clarified. No one is trying to predict outcomes. By definition, innovation is uncertain. I’m not going to tell you these things come, I don’t know. In the pharmaceutical industries, you have a 20% probability of developing a successful molecule, say. This is impossible. What we’re looking at is the incentive to engage in R&D competition. In some industries -- I’m not going to be making a general claim -- innovation is indeed uncertain, but predictable, in that you are predicting what are going to be the consumer needs. That was one of the aspects in Dow/DuPont. We saw the research targets of those companies were very well defined. Very early on, they would know what type of crop, what type of pest, what type of science they needed. That was very precise. They wouldn’t put some money into the pot, wait five years and said, ‘let’s see the outcome, and at this stage we decide whether there is going to be a pesticide for this, for that’. They were not doing that. This is maybe related only to the agrichemical industry, but in that case innovation cycles were quite predicable. The colourful variant [to the myth that ‘it is impossible to predict the future’] is that ‘the Commission is trying to predict the winner of the World Cup’, which is something I’ve already discussed. We cannot predict the winner of the World Cup, but we want to make sure that the tournament – in a sense, R&D is a tournament -- remains competitive, inducing all teams to compete. The only prediction I have now is that Italy will not be the winner [of the World Cup], because Italy did not even qualify, so this I can say for sure, unfortunately. ‘It’s impossible to measure innovation.’ Again, it’s going to be something industry-specific, but there are several metrics depending on the industry. In some industries R&D is going to be important. In Dow/DuPont, R&D was too aggregate. As I said, they were targeting specific areas, so R&D would have been too wide and imprecise in that context. So we looked at patents, and why did we look at patents? Because in an industry each firm is monitoring the competitor for different purposes. They are monitoring the patents. It’s a common business practice in the industry. They even have databases and software tracking each other. They had a software called PatentSight and we used the software of the company. We didn’t do anything novel; we just used a business tool that the companies [use]. Of course, you may disagee with analysis we run, but not with the fact that patents are important. This is relevant in the pharmaceutical industry. It’s going to be relevant in the agrichemical industry. I don’t think it’s particularly relevant in the way patents apply in the [information and communication technology] industry for instance, because patents are used in a different way. It is possible to measure. Another myth: No guidance for economics. Economics literature is all over the place. There was always this tension between Arrow and Schumpeter. I think a contribution of what we did, in particular the Chief Economist team with Giulio Frederico and Gregor Langus, is to re-focus a little bit our attention. This literature that allegedly provided no guidance actually was a relevant literature on innovation widely defined, but not specific to mergers. There was innovation and market structure, innovation and globalisation, innovation and trading integration. A lot of interesting things, but nothing specific to the unilateral effects that merging parties have to innovate after the merger. We just re-focused attention. The clarification that we did with our work goes back to earlier work in the ’80s when we were looking at R&D joint ventures. Many of the relevant economics was already there actually, plus it was in policy papers. I think the economics literature does provide guidance. It’s very useful. Exactly the limiting principle I told you: when you have a strong case, when you have a weak case, they do come from a correct reading of the economics literature. This is quite important I think. There has been lots of confusion, sometimes not just a matter of semantics, on this concept of appropriatability. People are mixing up different concepts with appropriatability. The definition of appropriatability in the R&D literature -- in the sense it was used by Kenneth Arrow in the original contribution in the economics of innovation -- appropriability really is related to the presence of spillovers. Appropriability means, if you innovate, if you put some effort which is costly to you, do you reap the gains from that innovation or do you confer some gains on your rivals as well? If you confer gains, some benefits on the rivals, it’s low appropriability. If you’re not, it’s higher appropriability. This is related to the presence of involuntary spillovers and we can debate. But in many industries, for instance in the agrichemical industry, involuntary spillovers are not particularly high, because of patent protection. Plus, having mixtures that extend the life of active ingredients when they go off patent means that they are pretty good at appropriating, so the spillovers are not particularly high. This is sometimes confounded with pricing effects: ‘Appropriability means the ability to increase prices due to merger.’ This is not what appropriability is about. Lack of appropriability is good for a merger, because you internalise the effects. But a pricing effect coming from a merger, precisely because you will have this ability to coordinate your prices for future products, is always bad for consumers. It is consumer welfare that matters in the end. A clarity between appropriatability and pricing power I think is appropriate. An interesting -- it’s not a myth, I think it’s a criticism: ‘the economic models that we analysed show that the effects on innovation are small.’ Again, not so fast. You may have a small effect in innovation, saying that after the merger, yes, the change in innovation effort is not that large, which is a fair point. Many models would tell you this. But this does not imply therefore that innovation is irrelevant. Precisely because once you have innovative products and they have been invented, you still have the pricing effect. The negative effect on consumers can still be large after a merger, because of this. The last point is: ‘the Commission never accept efficiencies.’ Why did I say this is a myth, I don’t know. Jokes apart, or half jokes apart, I think it’s important not to confuse standard and burden of proof. You’re lawyers, I’m not. The burden may shift between agencies and the parties. This is a legal matter, I have nothing to say. I can just say that for whatever reason in Dow/DuPont, for instance, we did not receive any efficiency submissions. I could not assess the relevance of spillovers, I could not assess the effect of whether there were complementarities, simply because they were not submitted. But I’m saying they should be analysed according to the same standard. The same standard means: if in my innovation theory of harm I’m looking far ahead into the future -- say for a certain industry, I’m looking 10 years -- I should also accept whoever has a burden of proof to show efficiencies, they should be aligned over the same time period. If I do 10 years, you do 10 years. In terms of quantification of the effects and time horizon, they should be aligned. These are, I hope, some useful clarifications of what we did and what we did not say. In how to run a case, I think you have some ideas here. Now I’m going to venture into something much more exciting, which is state aid in innovation. First, the focus of state aid and the focus of mergers of course are slightly different. Sometimes it is very different. State aid aims at solving a market failure while having limited distortions. The presence of a market failure is a prerequisite for a state aid case. Instead, when we do merger control, we try to limit the distortions coming from the reduction in competition products, R&D, etc. Of course, the presence of a market failure may be part of our assessment, but it’s definitely not a prerequisite. Sometimes we are talking about economic contexts which are rather different. In a merger, the counterfactual will be some organic growth among firms in a certain industry. In state aid there is an external intervention in the market that may induce entry that would have otherwise not occurred, or may prevent exit that would have otherwise occurred. In state aid, you target a market failure -- that’s the starting point, otherwise you don’t have a state aid case -- and then you look at the potential distortive effects. The distortive effect typically comes from displacing some private incentives to compete, or to innovate in our case. Crowding out. The incentive effect is a focus in state aid, plus you have also the subsidy race between EU countries, which is a concern. Though the economics of innovation may be similar, the economic contexts where innovation takes place are often different [between mergers and state aid]. Are they similar though? Some economic elements ought to be the same. I mentioned already extensively, involuntary spillovers. To countries, a spillover is almost a prerequisite for a good state aid case, because the presence of spillovers would imply that the market does not function properly, and so you want perhaps to compensate with subsidies to have more R&D or more innovation. The presence of spillovers would also be a case for a good merger to happen. If there are technological spillovers, you still have a good state aid case and a good merger case. Whether technological spillovers are equally present, in state aid cases and the mergers that we analyse, is a different matter. Also closeness in innovation, which I said is our concern in mergers. In Dow/DuPont, there was a lot of time spent looking at this closeness. Also in state aid, when you look at incentives to displace some private investments, that will be more likely if it is our close competitors, and less likely if they are less-close competitors. So there are similarities. Now we have similarities that may often turn into practical differences. Financial contraints: to what extent companies need to consolidate or merge because they don’t have good access to capital markets; to what extent a state aid case can be built on the lack of funding to firms. I would say -- this is just my general view, of course -- that the presence of capital market imperfection, information on assymmetries and financial constraints, state aid is more open to this kind of argument. In mergers these arguments fly much less. Also because typically, although not always, in state aid you’ll deal with small firms, and with small firms lack of access to capital markets is quite a powerful argument. In mergers, almost by definition, we always look at very large firms. I don’t know if capital markets are perfect. Probably they are not. But if there is anything close to perfect capital markets, as imperfect as they might be, it’s capital markets for large firms. There is an exception though, because in state aid sometimes we also allow lots of state aid to large firms. Maybe there is some problem there, because we have to understand better. Another possible area of differential treatment is sunk cost. In state aid, when we talk about R&D sunk costs, they are sometimes at a very high level described as an exit barrier which gives incentives to rivals to keep innovating. This argument, however, is never spelled out in details. In a merger case, this argument wouldn’t fly at all, unless there is much more evidence and much more work. In general state aid stays at the very high level whereas mergers is much more analytical. Maybe that’s the difference in approach. But I think there is potentially an area for clarification on this, or at least to bring mergers and state aid more close to each other. Then a problem when there are non-EU countries which are giving subsidies themselves. This is a relevant factor for allowing state aid. Instead, in mergers when you study rivalry, the assessment is independent of the country of origin; we don’t distinguish. Innovation is present in both mergers and state aid. State aid stays perhaps at some higher level, more descriptive, definitely less analytical. This means that in state aid we are more lenient in terms of the evidence which is needed to accept a market failure and reject the competitive distortions. There is more work to be done there. But in mergers we become more analytical and maybe there are going to be some interesting spillovers from mergers to state aid. Learning about mergers may inform us about state aid too. Remember when I said the myth is that ‘the economic literature cannot provide guidance, because there are always opposing tensions.’ Sometimes this debate is characterised by Arrow versus Schumpeter. Kenneth Arrow said ‘competition is good for innovation’, and Schumpeter said ‘you innovate because you want to get market power’. Which is a correct description of what they said. But sometimes those who accuse, in the merger context, the literature of being ambiguous, they do a logical fallacy. They say, ‘Schumpeter said that you innovate because you get market power.’ But then, the logical fallacy, they do the reverse causality – ‘you need market power to innovate’ -- which is nowhere to be found in Schumpeter. There is not this alleged tension Arrow versus Schumpeter in the merger camp. When it comes to antitrust enforcement, instead, this argument is more powerful, because indeed you innovate in order to get market power. If antitrust means being of course a cap on market power because of very intrusive interventions, then indeed you create a tension there. Here in antitrust, the argument of this tension, Arrow versus Schumpeter, actually is much more powerful than in the merger context. This is in itself a topic for a conference, but if you enjoyed my topics, perhaps you’re going to invite me again. This is where I will conclude for now. Gavin Bushell, Baker McKenzie: I very much welcome your willingness to engage in an ongoing debate about innovation, particularly in the sphere of mergers. The tenor of that debtate, in my opinion, has changed rather dramatically from rather frenetic, dramatic, alarming, shocking language, to a more sort of balanced view. Some of the myths that you’ve put up there, I think you’ve helped to dispel. Some of the alarm originally I think was rather well placed, because in the papers that you wrote last year in October, there wasn’t really very much discussion of spillovers; they’re hardly mentioned. Efficiencies were mentioned in passing. No talk about streamlining, rationalisation. There seemed very much a big effort to create a economic presumption, if you will, that mergers fitting those facts would be de facto presumed to be anticompetitive. So I’m very grateful for this broader discussion now about these procompetitive elements that you have mentioned. I think now where we are is, there is no presumption, that’s recognised, each case turns on its facts. There should be a neutral approach. The problem that I have and the question for you is, we have this unfortunate confluence of highly economic debate and a legal framework. As we all know, the court has awarded the European Commission a wide margin of discretion. Theories of harm only need to be plausible, perhaps particularly plausible, but there’s no higher standard for complex theories of harm. The problem that we have is that what you’ve identified are innovation spaces that focus on research, dynamic efficiencies. And the issue is that, that’s a very complex debate to have and you’re only looking at one side of the coin, which are the negative effects. The question is: why cannot you have a more rounded discussion about the incentive effects upstream in the round, looking at both elements earlier in the discussion, rather than pushing it all onto the parties to look at efficiencies. I take the point that that’s the legal framework and that may be right for static efficiencies relating to production, relating to actual markets. But when we’re talking about ephemeral or very difficult areas to assess, like innovation spaces, perhaps a more nuanced debate is required. Valletti: Guys, you should also do some self criticism. Part of this hysteria was created by people like you, including yourself. Be careful also. When in all the papers we wrote, these were economic papers written after the decision. In the decision everything is actually written without algebra, without formula, in a very nice language. You have a tendency to extrapolate out of context a phrase. You will find that our model said, ‘in this model we don’t consider spillovers blah, blah.’ It’s put in the first line, that’s not what we do in this paper, then the rest follows. You are exactly one of the guys who, out of context, like to pick -- maybe that’s what the lawyers do, so ask yourselves. That’s not what the economists do. Sometimes leave it to the economists to have the economics debate, my colleagues from E.CA would certainly be good at doing that analysis. Unfortunately the debate created this hysteria because there were large interests at stake. I’m an academic; I like to genuinely understand the question and that’s what actually drives me. I really disliked the reaction from the legal profession, and I have to be absolutely honest that having highly paid people whose job is just directed into the destroying message, instead of constructing a better understanding. I think instead we showed willingness to try to understand the question. The papers that now are published, they are coming out in journals which are subject to refereeing. They’re not published in the legal journals without any refereeing process. The academic standards are actually higher. I was also very naïve coming from academia, the enthusiasm. I learned also my lesson, good for me. But I didn’t like the process at all. So ask yourselves if you contribute to this or not. But I hope my message today was instead a much more positive message. Don’t get me into the question, is there an economic presumption. As an economist says, I gave you some factors. If those factors are present, then it’s a strong case against the merger. If these factors are present, then it is a good case, the merger should be allowed, other things equal. That’s where I can stop. A debate for you, though, is on the legal standards of efficiencies. I’m very open to those. I said repeatedly that I am open to efficiency submissions. I don’t know why many of you advise your clients perhaps not to submit efficiencies. One story I heard is that because if these efficiencies are really good and they are convincing, then you are scared that the remedy may be bigger because of course, you have to compensate for a remedy taker, the lack of those efficiencies. I don’t know why those efficiencies were not submitted. Maybe because it’s the negative circle that we have created. You expect the Commission not to take efficiencies seriously, therefore why should you spend any effort in submitting efficiencies, because they will never be taken seriously. Therefore you submit something which is very shady and we will say ‘ha, these efficiencies are really bad, we are not convinced.’ How to change the type of equilibrium I don’t know; working together that is a possibility. But it’s an important question. As an economist I cannot say what’s the legal standard. I’m simply saying, as I said, there are positive factors from the mergers. Who has the burden of proof to look into those? [That’s a] question for you. Unidentified: I was very, very interested in your comments on the perils between state aid assessment and merger assessment. You just mentioned very quickly that there might be some spillovers from the two areas. I was wondering whether you had any ideas yet on what kind of spillovers. I think that is a part of the assessment, whether the aid will go to a project that creates innovation and creates consumer benefits. Then could that be the spillover or is it more from the other side, to state aid? Valletti: It’s even more exciting because there are also some obvious linkages between say, state aid and antitrust. Sometimes we are giving money, for instance, to firms to cooperate in R&D, but then we may come later down the line saying, ‘But you colluded over something.’ We have always to look in a more integrated fashion. Thank you very much. Always a little bit of discussion with Gavin is welcome in this context. I’m sure we will meet again very soon.